We are sorry to announce that Carmen Consoli’s concert of the 27th of November at VK Concerts in Brussels has been cancelled. “Music, art, they are forms of beauty and sources of great happpiness. This is why I believe you will forgive me if, at present I can’t find in my heart that joy which has always made me play. Last friday I spent the night shut in, hearing appalling sounds coming fron the street: cries, gunshots, sirens wailing. I cannot sing, voice choked in my throat. I’ll be soon back on the stage but not now. The overseas tour will have to wait. All tickets will be refunded shortly. Three times Platinum records in Italy, the first Italian female artist to perform at the Olympic Stadium, with more than two million albums sold, this young Sicilian star in his songs explores the richness of individual and collective memory while developing a highly personal musical universe. Drawn inspiration from Verga and mythology, she has also used Arab and French in her songs. A real revelation since 1996, when she recorded her first album and participated for the first time at the Festival of Sanremo, in the following decades she has become (through an extraordinary discography of 15 albums) one of the most popular and continuative artists in Italy . Her “voice full of pain, compassion and strength ” ( Jon Pareles – New York Time) sings lyrics anchored to Sicily, whose characters suffer of gossip, stories of disappeared sons, treason or dreams of greatness. The only Italian artist to take part in the Bob Marley’s death memorial ceremony, she performed as headliner at a concert in Central Park. During her career she played in different French-speaking countries: France , Luxembourg , Canada (in Montreal, at the well-known Francofolies Festival and Toronto ) and in Great Britain, Spain, Netherlands, Portugal , United States , Ethiopia, Mexico , Argentina. 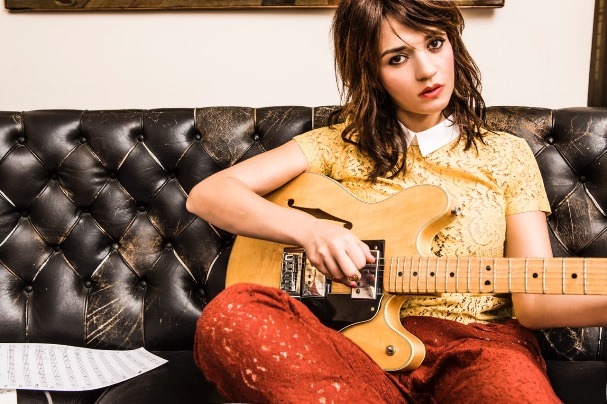 Defined by Jon Pareles a beautiful combination between a rocker and intellectual, Carmen Consoli collaborated with important artists such as: Goran Bregovic, Angelique Kidjo, Henri Salvador, Franco Battiato. Lorsque Carmen Consoli participe pour la première fois au Festival de Sanremo en 1996, on peut dejà voir en elle une véritable révélation et deviner qu’elle va changer, à sa manière, l’histoire de la musique italienne. Dans les décennies suivantes elle devient (avec une extraordinaire discographie de 15 albums) l’une des artistes les plus populaires et constantes de la chanson italienne. Première artiste féminine à s’être produite au Stade Olympique de Rome, elle a également créé son propre label. Trois fois disque de platine en Italie, avec à son actif un million d’albums vendus, cette jeune star sicilienne explore dans ses chansons la richesse d’une mémoire individuelle et collective tout en développant un univers musical très personnel : une “magnifique combinaison entre rockeuse et intellectuelle”, “une voix pleine de douleur, de compassion et de force” (Jon Pareles – New York Time). Elle pose sa voix sensuelle sur des textes qui restent ancrés en Sicile par ses personnages qui souffrent du commérage, ses histoires de fils disparu, de trahison ou de rêves de grandeur. L’attente fut longue mais après cinq années de silence les fans peuvent se rassurer, elle revient avec son nouvel album : L’abitudine di tornare !! !